Every year, around this time, a magical transformation starts to take over grocery stores. Cucumbers, watermelon, and strawberries fade into the background, and heaps of pumpkins, butternut squash, and kabocha take their place. Cinnamon and nutmeg appear front and center on the shelves, and the whole produce section shifts into tones of gold, red-brown, and dark green. Until the décor changes again for Christmas, squash will rule the roost. It’s officially squash season at Paleo Leap lately too, with mouthwatering recipes for acorn squash and apple soup and chicken and pork stuffed squash taking their place alongside classic favorites like butternut squash fries. If you already love winter squash, the seasonal bounty a dream come true. But if you’re not used to cooking with them, the huge piles of bumpy, tough-looking gourds in the grocery store can be pretty intimidating. That’s what this article is for. There’s really nothing complicated or difficult about squash once you get to know it a little better – once you’re familiar with it, you’ll be able to confidently pick up one (or more!) and get right down to the fun part: cooking with it. A species native to North America, squash is one of those foods – like potatoes – that aren’t technically “Paleo” but are still healthy and delicious. They’ve been cultivated as early as 7,000 BC by traditional peoples living in Mexico, and by the time European explorers arrived on the continent, squash had spread to almost every indigenous American culture. Before the invention of refrigerators, winter squash were important vegetables because they keep so well: given a cool, dry storage location, some species can stay good for up to 6 months. Underneath that imposingly thick skin, winter squash hides a significant nutritional payload. All species are high in the plant form of Vitamin A – which isn’t as bioavailable as the animal form, but valuable anyway. They’re also full of Vitamins C and B6, and have smaller amounts of almost everything else – even a little bit of calcium. The exact value varies with the variety (for example, darker orange varieties like pumpkins have more Vitamin A than paler varieties like spaghetti squash), but whatever you pick, you’re getting something healthy. Even better, winter squash is suitable for almost any kind of elimination diet, because it doesn’t contain FODMAPs carbohydrates, histamines, or goitrogens (chemical compounds that can impair thyroid function). 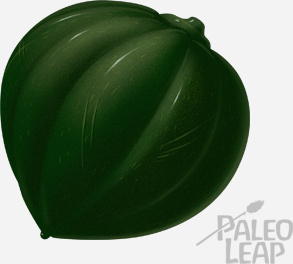 It’s not a nightshade, it’s allowed on the autoimmune protocol, and it’s even vegan! It’s savory enough for adults, but sweet enough for kids, especially if you sprinkle a little cinnamon on top. So if you have to bring a dish to any kind of family potluck or communal lunch, winter squash is one thing almost everyone will be able to eat. How to identify it: acorn squash is the shape of an acorn (hence the name), and about the size of two fists held together. It’s can be dark green, orange, white, or speckled with any combination of those three colors. There are deep ridges in the skin running from stem to tip. If you look up at the picture above, acorn squash is on the far right. How it tastes: acorn squash is a little nuttier than other varieties of winter squash, so it’s perfect if you want something more savory than sweet. How to identify it: buttercup squash is shaped like a pumpkin that got squished a little: it’s bumpier and a little knobbly. The skin is dark green, sometimes with lighter streaks, and usually with a lighter patch at the top. In the picture above, buttercup squash is on the far left. How it tastes: buttercup squash is comparatively sweet, but not quite as sweet as its similarly named cousin, butterNUT squash. It’s also a little drier. How to identify it: butternut squash is a pale tan color. It’s usually longer than it is wide, sometimes with a bulge at one end. In the picture above, butternut squash is in the middle. How it tastes: butternut squash is one of the sweetest varieties of winter squash, and it has a rich, smooth texture – if you’re going for a kid-friendly recipe, this is a great one to pick. How to identify it: delicata squash is about the size and shape of a large cucumber. It’s pale yellow, with vertical green stripes. If you want a visual, look back up at the thumbnail: delicata is on the far right. How it tastes: delicata squash has a very mild flavor, although not quite as mild as spaghetti squash. 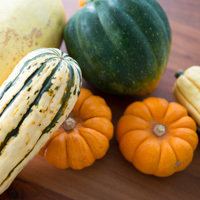 Cooking tip: delicata squash is unique among winter squashes in that its skin is edible along with the flesh. So you don’t have to worry about peeling anything: just chop it into bite-sized pieces and roast it until tender. How to identify it: kabocha usually looks like a regular pumpkin that’s been painted dark green, but some varieties are also orange and look almost like pumpkins, except that kabocha squash is a darker red-orange than the typical bright-orange pumpkin color. How it tastes: kabocha is a little drier than other winter squashes, so if you overcook it the texture can get unpleasantly sandy. But roast it just long enough, and it’s pleasantly light and almost fluffy in texture, perfect to balance out a very rich or heavy main dish. How to identify it: the huge Jack-O-Lanterns aren’t actually what you’re going for here; they’re edible, but they don’t taste that great. Look for the miniature versions sold as pie pumpkins. 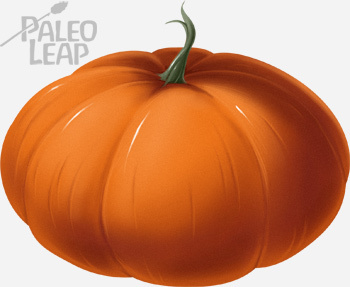 Alternately, you can buy canned pumpkin – unlike most other canned foods, pumpkin doesn’t lose a lot of nutritional value. Canned pumpkin is a great “starter squash” because there’s no dealing with skin, seeds, or anything else. How it tastes: without the sugar overload of pumpkin pie, the pumpkin itself is actually quite rooty and woodsy; it makes a great savory side if you’re tired of sweeter squashes. How to identify it: spaghetti squash is oval-shaped and pale yellow. The skin is smooth, without any ridges or bumps. For a visual, take a look at the pictures in this recipe. How it tastes: spaghetti squash is extremely mild, almost to the point of being bland – but that’s not the point. The real value of this variety is as a pasta replacement: top it with sauce, meatballs, butter…anything you would normally serve with pasta, you can serve with spaghetti squash. 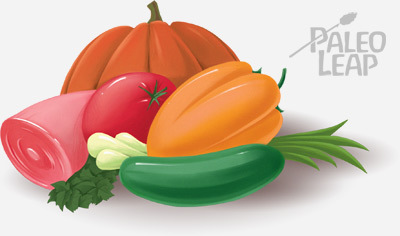 Winter squash aficionados probably already realize that this list is abbreviated. If you’re truly a squash gourmet, you might also remember the charms of Hubbard or banana squash, or maybe the striking red color of turban squash. Or possibly you’re attached to the convenience of the tiny sweet dumpling or gold nugget squash. It’s true that winter squash has a lot more subspecies than described above, but most of them are harder to find (depending on where you live) or intimidatingly difficult to cook if you don’t already know how. That’s no reason not to enjoy them if you already love them, but for squash novices, starting with the popular varieties is generally easier and less confusing. Of course, a perfect way to avoid this conflict entirely is to buy your squash at a farmers’ market, where you can ask the farmer what it is and how to make it delicious. The easiest, most basic way to cook winter squash is to roast it. You can do this with any species of winter squash, so if you aren’t sure what you’ve got or how to cook it, roasting is always an option. First, cut the squash open and remove the seeds. You can leave it in large pieces to make a very impressive presentation or chop it up into smaller bite-sized cubes. Brush it with Paleo cooking fat, and sprinkle with spices (cinnamon and nutmeg are delicious, and add a little salt to bring out the sweet flavor even more). Then roast it until you can easily poke it with a fork. That’s all! Once you’ve mastered the basic roast, you can get a little fancier by stuffing your squash, chopping it into fries, or blending it up into soup. Most kinds of winter squash can be substituted for one another, so don’t be afraid to experiment with different varieties here, even if the recipes are written with one particular type in mind. However you decide to cook up your squash, don’t miss out on finding some way to enjoy it while it’s seasonal and cheap. Getting a hold-the-phones amazing pumpkin or acorn squash recipe under your belt now can help you liven up the upcoming holiday season with healthy but delicious fall and winter menus. After all, who even wants watery, store-bought pumpkin pie when you could have all the color and flavor of the real thing?